Earlier this week, evidence surfaced that Final Fantasy XV Pocket Edition was likely on its way to consoles, and now Square Enix has officially announced the game for Xbox One, PS4, and Nintendo Switch. You can check out a trailer for the upgraded-for-consoles Final Fantasy XV Pocket Edition HD, below. 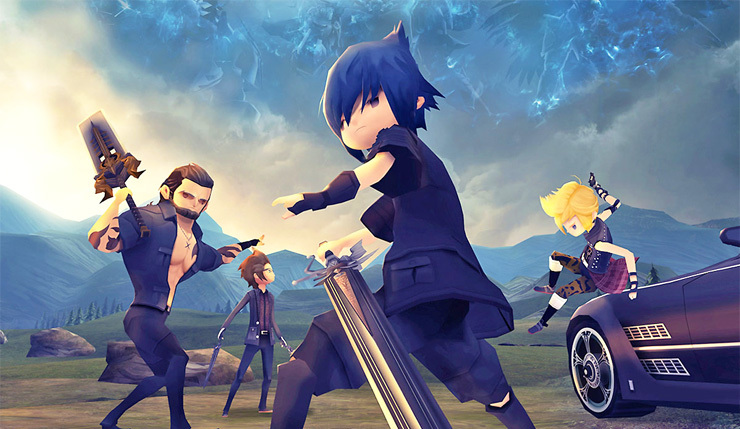 Final Fantasy XV Pocket Edition retells the story of crown prince Noctis and his brothers-in-arms across ten thrilling episodes. With Final Fantasy XV Pocket Edition HD and newcomers alike can follow the journey of crown prince Noctis and Prompto, Ignis and Gladiolus, with fully voiced key event scenes and faithfully recreated battles. All of the treasured moments from FINAL FANTASY XV, like driving the Regalia across breathtaking landscapes, camping, Chocobo riding and more, can be experienced in a whole new way with the game’s creatively reimagined art style and in HD resolution. Final Fantasy XV Pocket Edition HD will set you back $30, although Square Enix is offering a limited-time 40 percent discount, dropping the game’s price to $18. The discount is only available until September 13, so take advantage while you can! What do you think? Are you at all interested in trying out FFXV Pocket Edition? Doing a chibi version of a triple-A RPG is a somewhat odd concept, but reviews of the game have been fairly positive. I never made much headway in Final Fantasy XV, too many other games on my plate, so maybe this Reader’s Digest version is for me.